Yesterday was my oldest daughter A's birthday (on the left). She turned 8! Last week, my youngest, Z. turned 5. Yes, February is a big month in our family. Happy Birthday(s) my little ladies! It got me thinking about how far I've come in terms of understanding nut allergies. I'd heard of them before my daughter's diagnosis, but did not think we were at risk. It's scary to hear that the child you thought was perfect has a serious medical condition, especially when it relates to a common food that most kids love. It sounds like a joke, actually. Remember that game, "Frogger?." (Now I'm dating myself.) The frog has to dash through a ridiculously busy street without getting squashed. It's harder than it looks. That's what parenting a child with severe food allergies feels like sometimes. You're constantly dodging through traffic, in my case peanut butter and all its incarnations. In the 4 years since we learned of our daughter's allergies, a lot of progress has been made, both medically and in society's acceptance of food allergies. That's wonderful. Sadly, more and more children are being diagnosed. In the midst of the fun and activity, I thought about the other children being born on my daughter's birthday. How many of them would share her allergies? My future hope is that someday there is a cure. My other hope is that food-allergic kids and their families get the support and compassion they need. In the meantime, you know what? I was always pretty good at "Frogger." 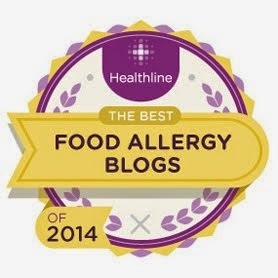 My Food Allergy Article for "Chicago Parent" Is Now Available! This just in--my husband just brought home the latest issue of Chicago Parent magazine, with my article "Playing Safe: Coping with Food Allergies at Parties and Play Dates." In it, I discuss the ways that food-allergic school age kids can keep safe and have a normal social life. It also gives tips for parents of non-allergic kids on things to know if you're hosting your child's food-allergic classmate. I'm very excited to see its publication and grateful to Chicago Parent for letting me get this important topic out there. I especially hope it is useful for parents of both allergic kids and non-allergic kids. Let me know what you think. 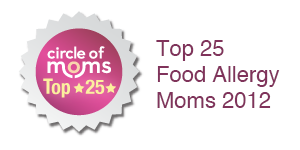 I also like the short article they teamed it with, in which they talk about Chicago mom Kim Kutz's allergy-free cookbook, "The Welcoming Kitchen: Allergen-Free Recipes for Snacks & Goodies." Her web site is http://www.welcomingkitchen.com/. A reader recently posted with a question about what type of allergen-free recipes might be OK to bring a bake sale. 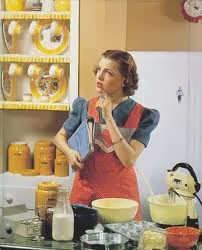 I have not read Ms. Kutz's book yet, but it seems like a good bet you'd find some good and "safe" recipes there. I'll definitely check it out. My family plans to move this fall in order to be closer to my husband's (relatively) new job. We are excited about this move and have been planning it for some time, so that's not an issue. I won't bore you with all the horror stories of a buyer's market, but our plan is that our daughter will be in a new school next year. As our move gets closer, I've started to realize that, just as my daughter has fears about being in a new school environment, so do I. After all, I've ironed out every last detail with regard to food allergy management with so many people: my daughter's school principal, nurse, teachers and even the parents of her friends. But now I'm going to have to start from the beginning. I'm not going to lie - even for a seasoned "Nut-Free Mom" like me it's kind of scary. Every school has a different policy (more on this in a future blog entry! :)). For food allergy families, school becomes like a box of chocolates: you never know what you're gonna get. So, I say, Be prepared, not scared. For allergic families, that's as good a motto as any. You need to talk to the school and find out how the district handles food allergies, pronto, so you can prepare your family for a smooth transition. If your new district does not yet have a formal policy, I suggest printing out the Wilmette Public Schools food allergy policy and sending it to your district's superintendent of schools as well as the principal. This is the policy that was finally adopted by my daughter's current school district after a small group of parents (including yours truly) brought it to their attention. It's a good one! 1. Work with your doctor to prepare an easy-to-follow action plan. Your school is going to want one of these, first and foremost. If there is ever an emergency, your written plan is what people will follow, so make sure it's thorough and clear. 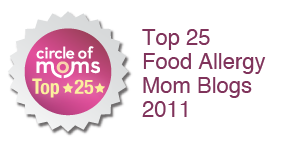 FAAN has food allergy action plans you can download and I suggest filling one out with your doctor ASAP. Then, make copies for the nurse, teachers and whoever else may need one. Include your child's photo for easy identification in the event of substitutes or staff changes. 2. Meet with the principal before the first day. A face-to-face meeting is a great idea that will do a lot to a) show administrators you care and b) attach a human face to your child's medical issues. This is a great time to discuss any questions you have about school policy. Principals are busy people so it doesn't hurt to jot down some"talking points" before you meet. I'd schedule this meeting, if possible, before the end of the current school year. 3. Renew prescriptions and make sure you have enough EpiPens for all staff that require them. The school my daughter attends is relatively large, so she has 3 epinephrine auto-injectors for school: one for the nurse's office, one she carries on her person in a "fanny pack" and one in the cafeteria. That way, no one is racing around looking for one in an emergency. I'm sure there is more I will think of as I prepare, also, but this is a good start. My last blog post reminded me of something I just read in my daughter's elementary school newsletter. The school is having their Winter Carnival in about a week and the PTO is looking for people to contribute home-baked goods. This year, for the first time, they asked parents to label the baked goods "Nuts" or "Nut Free." I didn't know whether to laugh or cry when I read that piece of info. Don't get me wrong. I'm thankful to the PTO moms who even thought about food allergies in the first place. And I know that they mean well. But if your child has a nut allergy, you know it's not that easy. It made me wonder who advised them on this issue. Had I known, I would have put my two cents in. The good intentions of the PTO mothers, unfortunately, will be wasted on any food-allergic family that I know. We won't touch home-baked items from people we don't know (and of course no bakery items) because of the cross-contamination risk. Here's the problem: just because an item was not baked with nuts doesn't make it nut free. For example: You use a knife to spread peanut butter on your kid's bread. You then slice into a stick of butter and spread that on your other child's bread. You put the butter back in the refrigerator. Then, you decide to make a recipe for the bake sale that uses a half a stick of butter. You add the butter that touched the peanut butter knife into the recipe. You bake your brownies, cookies or whatever and you don't add nuts. Then you label the item "Nut Free." Voila! It's now contaminated by peanut matter not reflected on the label. That's one scenario. I can think of many others, such as using a non-safe cake mix or frosting, or candy cake decorations that may have been processed on lines that process nuts. Besides utensils, shared bowls or the baker's own hands can transfer peanut or nut matter into recipes. See, I know it sounds nit picky. But I can't risk my child having an allergic reaction. So of course we won't eat your home-baked treat. I'm sure it's delicious. It's nothing personal, really! I considered baking a treat for the carnival and labeling it "Nut-Free. Prepared in a completely peanut-free, tree-nut free kitchen. My kid is allergic so I know what cross-contamination is. Eat it. It's safe. REALLY." (Or something like that.) I can still contribute, but I'm not counting on a food-allergic family to bring my treat home unless they know it's baked by me! If I read that label, I'd still steer clear. You just never know. Better to skip the cake walk and bake something for my daughter at home. Better still if we could have "non-food" alternate prizes for various games and activities. Maybe next year! If you have a child with a nut allergy, you will soon come to know the "Baking Mom" intimately--because it will be one of the roles you'll be asked to adopt. I view the title of class "Baking Mom" as an honorific I have come to cherish. Bakeries quickly become (not to sound too Brady Bunch, here) "taboo" when you find out that your child has nut allergies. Too much risk of cross-contamination. Ditto for ice cream parlors, but that's a whole 'nother blog entry. Whether you harbor an inner Martha Stewart or not, the minute you become the "Baking Mom" you discover that you better know how to wield a pastry bag with some skill and aplomb if you don't want to embarrass your child at their birthday party (or at someone else's party. You're sending their own treats, there, too.) Hey, if the supermarket bakery can do it, so can I. It's not always easy to find the supplies you need to basically open a small-sized bakery right in your home kitchen. Wilton has some excellent cake pans (including one for a Barbie cake--crucial for girls, I've found) as well as lots of cake decorating supplies like pastry bags and tips, how-to books and videos. (Important note: Wilton's new ingredients labels on decorating sugars and some frostings give allergy warnings for peanuts and tree nuts, though, so skip those. I'm still looking for across-the-board safe sugars and decorating stuff, so stay tuned. When you are the parent of a food-allergic child, so many things feel out of your control. You know there will be times that your child has to miss out on certain things. However, when you put on your figurative chef's hat and become the "Baking Mom" or "Dad" you know you are providing your child with a treat that they can safely eat, along with the rest of the class. For that one moment or maybe that whole day, they don't have to feel different. That fact alone is worth a whole lot of little pink pastry bag "shell border" decorations that dye your fingers pink for about three days. Basically, giving your child the fruits of your baking labors is like offering them your love on a plate. Not a bad day's work. My days as the official class "Baking Mom" might be numbered. My younger daughter's pre-school, for example, does not allow home-baked goods due to the wide variety of food allergies (eggs, milk, peanut) represented. It may be a matter of time until the elementary schools have the same policy. Whatever happens, I know that I gave my sweet kid some sweets that had the best and definitely safest ingredient of all: a mom's love. I recently wrote about visiting restaurants safely and I have some new info (just gleaned from my info-packed FAAN newsletter) that I want to share. A lot of times people don't want to "annoy" waiters by asking for special treatment in restaurants. I've certainly felt that way myself. To paraphrase the newsletter article, you can't assume that restaurant staff will take a food allergy seriously. Don't feel like all you have to say is "If I tell the waitperson that my child can't eat (insert food here) then they'll be OK. I hate to make a fuss." They suggest that you be specific and say something like: "If my child eats peanuts, even a small amount, he/she will get very sick." FAAN's website has a Chef Card template that you can use. I downloaded it--it's not a bad idea to take one of these when you go to a restaurant. It allows you to fill in your specific food allergy and it also suggests to the staff how to keep things clean and free from cross-contamination. Now, not all restaurants are created equal. Will some folks look at you like you're insane if you hand them one of these? Possibly. But I think most (respectable) restaurants will either honor your request or tell you that they can't, in which case it's better to know ahead of time. Keep your standards high when eating out with a food-allergic person. I never thought I'd be grateful to Donald Trump for anything, but.... If you watch "Celebrity Apprentice"(I admit that I don't--but I think I might have to start) you already know that country music star Trace Adkins is currently appearing on the show to benefit The Food Allergy Anaphylaxis Network. This is the first time (that I'm aware of) that a commercial TV show has shed light on food allergies in this way. If you click the above link you can see video of Trace talking about his daughter's food allergies and his decision to support FAAN. I am thrilled that someone in the spotlight would choose this issue to support. I am not a country music fan, but apparently Mr. Adkins has had several hits including, (I must say one of the funniest song titles I've ever heard): "Honky Tonk Badonkadonk." Yeah, that's right. The song is all about butts. The video pretty much is a woman's worst nightmare, OK, you've got me there. But I laughed myself silly when I heard the song and I'm driving my husband crazy by singing it constantly. I would link directly to the video, but I'm trying to keep this a family blog. :) You can watch it on youtube if you want to. Let me just say this: it looks like they're at Gilly's from "Urban Cowboy" if the girls at Gilly's wore gold lame hot pants. Actually, I can't think of a better spokesperson at the moment. Here's the thing: this guy is clearly not all PC, which food-allergic parents are frequently accused of being, and that's the excuse for people not taking it seriously. Just imagine if Brangelina were the spokespeople for food allergies. Yikes. I thank Mr. Adkins for supporting this issue and I hope he's successful on "Celebrity Apprentice." Week 5 has just passed and Trump still hasn't told him "You're fired!" He's already beat out Gene Simmons of Kiss. That's pretty impressive in my book. And if Trace Adkins wins the competition, I may have to make "Honky Tonk Badonkadonk" my personal ringtone. I have to admit, restaurants were not foremost on my mind at my daughter's first allergy doctor appointment. 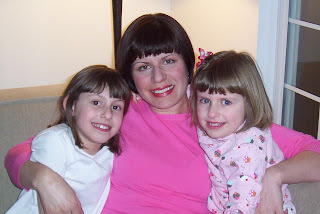 My oldest daughter was only four and my youngest was a year old. Our family was not exactly "restaurant-friendly" on a regular basis at that point. For one thing, neither kid wanted to sit down and eat for more than a few minutes and the baby hated all the excess "stim" created by a noisy restaurant (the only kind we would venture in with little ones). With the many concerns I had at that time, many of which didn't even hit me until later, I didn't focus too much on eating out. That came later. Oh, boy, did it ever. Once you have a family member with a food allergy, going out to eat is no longer a spontaneous, carefree activity. It takes on a certain intensity. You've got to arm yourself with lots of questions as well as epinephrine. Because you never really know what goes on in a restaurant kitchen, sometimes dining out with food allergies feels like you're playing Restaurant Roulette. As a "nut-free mom" I naturally avoid anything Asian when dining with my daughter. Unfortunately, I love Chinese, Thai and Indian cuisine. So that kind of stuff is reserved for nights out with my husband. But once you've jumped that particular dining hurdle, you have a whole slew of other problems from "American" restaurants. For example, why is it necessary make a fish filet "nut-encrusted?" Even McDonald's, once a relative haven for our nut-allergic daughter, has introduced nuts into a bunch of their menu items, mostly salads. These are usually packaged off-site, so the risk of cross-contamination is low, but still. And of course, peanut butter shows up everywhere in just about any venue. It doesn't look like that will be changing any time soon. Most importantly, kids with allergies should still be able to view eating in restaurants as a fun, sociable activity. I've found avoiding them to add to my daughter's stress when we finally do eat out. The more success we have in a restaurant, the better she feels. For kids with multiple food allergies, it's naturally a little trickier. I'd love to hear how parents handle that challenge. Since first grade, my daughter has been designated to sit at a "peanut-free" table in the lunch room at school. At her school, each class with an allergic child has its own peanut-free table, so she does have the opportunity to sit with kids from her class. I feel that this table is a "necessary evil" at this stage, because she is still so young. I say "evil" because while it does prevent her from coming into contact with ever-popular peanut butter, it can sometimes be at the cost of not being able to socialize with some of her friends at lunch. The peanut-free table has had its ups and downs for my daughter. Sometimes, several children congregate at this table--other times, not so much. It seems to fluctuate like the weather. Even though I know that being "stuck at one table" is painful for her at times, it is even painful for me to contemplate her being left out or in some way ostracized. Still, the peanut-free table has had its silver lining. For one thing, my daughter has had to learn to extend herself to others more, by seeking them out and getting to know them. She's found that she has a bigger group at "her table" when she goes out of her way to get involved with the other kids. Not a bad social lesson to learn at any age. Another nice side benefit: compassion for others. This year, one of the kids in my daughter's class has some developmental disabilities. She has sought out this child from the beginning of the school year, adopting the role of "helper" and special buddy. I praised her for her actions and she said, "Mom, I know what it's like to be different." I wish that she could choose to sit wherever she would like. However, I'm not sorry that she has learned a few things at this table, things that have to be learned from one's own experience and not necessarily from a parent or teacher.